Premier Inn offer a fantastic value meal deal at all of its great family friendly restaurant chains. 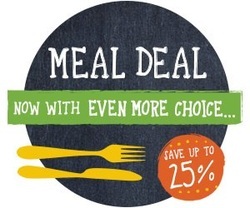 The meal deal offers are perfect when staying over at any of the Premier Inn hotels and include a three course evening meal, a drink and then followed up the next day by the famous 'all you can eat' Premier breakfast, from just £23.99. Enjoy a delicious evening meal from our specially selected Meal Deal menu at a Beefeater Grill, Table Table, Brewers Fayre, Thyme or Premier Inn restaurant, plus a drink of your choice. Then the next day, treat yourself to a freshly prepared eat as much as you like Premier breakfast. To take advantage of this great offer which gives you a saving of over 25% off standard prices, see the full terms and conditions, and to view sample menus from all our Premier inn restaurants just click on the button above.